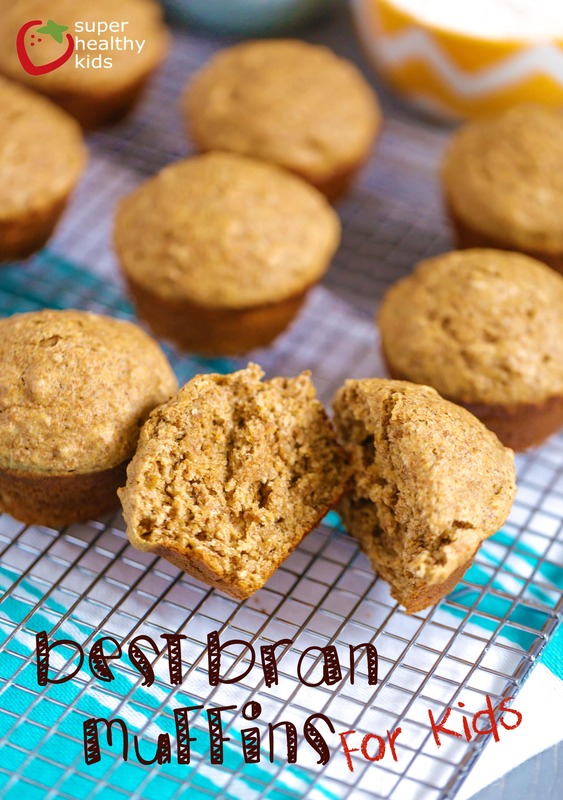 This is the best Bran Muffin recipe we have! You’ll want to bookmark it and come back again and again! Sometimes getting young kids to sit still and eat a meal is harder than trying to convince my husband that I really do need another pair of shoes! Sometimes I breakdown and let my kids roam with their breakfast so that they will eat something. A lot of times, kids can’t eat a lot of food at once. They have little tummies and get full after not eating much. Small portions of food packed with nutrients are the answer. 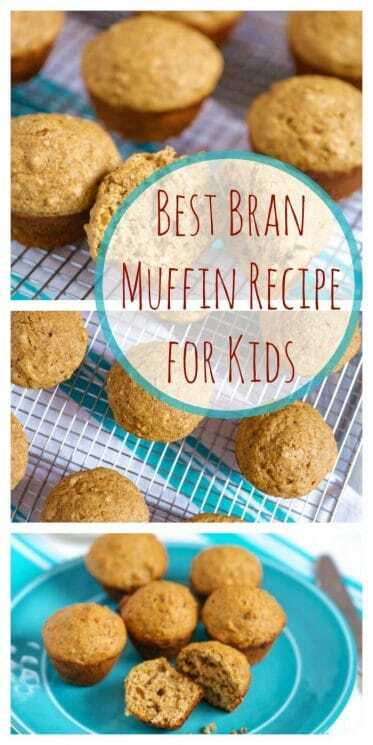 This recipe is the Best Bran Muffin Recipe for kids hands down! They are full of nutrients for your busy kids plus they taste amazing. Bran is the outer portion of a grain. It’s rich in fiber, vitamins, and even omega fats! Generally, when grains are processed, the bran is removed, leaving the grain void of many of the nutrients inherit in that food. But, we can actually grind up the part that is removed, and use it in baking! What to serve muffins with? 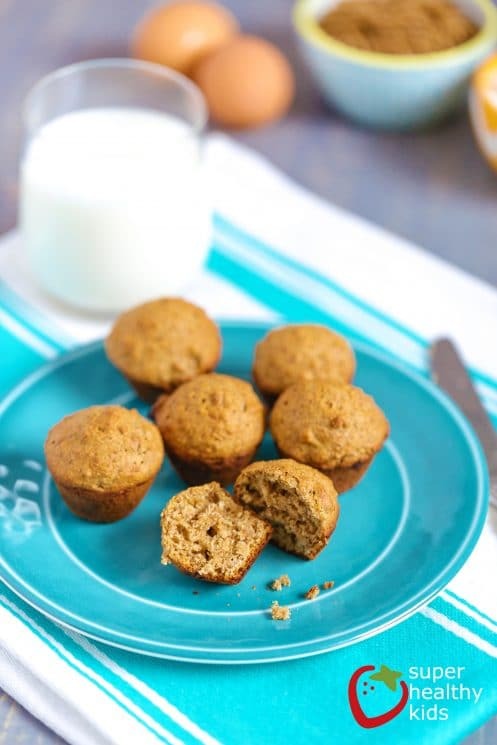 Serve these bran muffins with fruit and milk or yogurt for a complete breakfast. They are also great as snacks. This recipe makes a lot and so I always freeze them. Pop one in the microwave for 20-30 seconds and you have a warm and delicious little muffin that tastes as fresh as the day you made it. They freeze really well. Just store them in an airtight container. 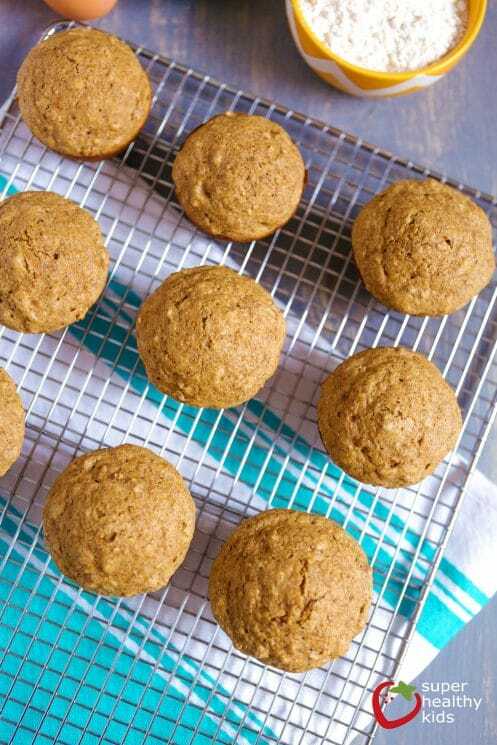 These muffins are packed with fiber and for some kids, constipation can be a real problem. You can make the recipe as is, or sometimes we like to add other things to mix it up. Some of our favorites have been: dried apples, freeze dried mangos, dried apricots, and blueberries. So yummy and it is fun for the kids to choose what goes in them. You can do some with one add-in and some with another to please everyone’s preferences! 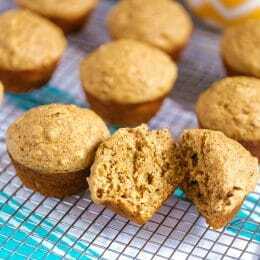 If you don’t want to make all the muffins at once, you can leave it in your fridge for up to 2 weeks and make fresh bran muffins everyday in a just a few minutes! Mix boiling water and 2 cups All Bran cereal together in a bowl. Set aside. Mix together butter, sugar, applesauce and eggs. Then add baking soda, flours, and salt. Add the All Bran and water mixture. Lastly, add 1 cup of dry All Bran cereal. Mix until blended. Grease a mini-muffin or regular muffin tin. Fill each tin 3/4 of the way full of batter. Bake for 10-12 minutes for mini muffins and 13-15 minutes for regular size muffins or until the muffins bounce back. I will definitely have to try these, I have a 3 year old daughter that sounds like Sophie. She is constantly on the move and does not like to sit and eat a large portion. I have been trying to set out lots of healthy snacks during the day and evening so I love your ideas. Do you think FiberOne cereal could be subbed for All Bran? You could try it, but the consistency will likely not be the same. The FiberOne cereal I have had is more solid – less mushy – if you will. I think it would make your muffins more gummy. The All Bran dissolves really well and makes the consistency of the muffin more smooth. If you try it, let me know how it turns out! Why not use bran flakes? I’m surprised you use a microwave. Microwaves are bad, we use a toaster oven to heat things up…. Love it, my kids eat those for lunch too:-) but because I live in Utah i have to live them in the oven 7 more minutes. I make Bob’s Red Mil High Fiber Cereal muffins with lemons instead of bananas. I will have to try these. What do you bake it at? 350? 400 degrees. Sorry I didn’t include that – kind of important! Thank you! I did the first batch at 350 and it just took twice as long but they still came out great! Love your recipes. The bean soup is on the menu for this week and I’m making the chicken nuggets right now! Thank you : ) sounds delicious! I was wondering.. Buttermilk liquid? Or dried? Ok!! : ) thank you very much! I will try it this weekend ! Ok!! Thank you, I will try it this weekend.. And should I use salted butter or unsalted butter? is it the same? Thanks : ) i will try it this weekend, and is it salted or unsalted butter? You can use either. I have used both and you can’t tell a difference. Thanks : ) sorry for reply many times.. I am getting familiar to this blog..
No worries! We love the feedback! there is definitely nothing wrong with your toddler eating these! They will be filling enough, so over-eating usually isn’t an issue. Thanks! will be trying them asap as I love any ideas to get some healthy snacks into my son to fill the gaps. That sounds great Sian. We’d love it! How do you think these would turn out if you crushed the All Bran? My kids have issues with “chunky” stuff! The All Bran actually almost ‘melts’ into the batter. It really isn’t chunky at all. If you are worried about it, then add all of the All-Bran together in step 2 instead of leaving some of it out to add at the end. The boiling water almost dissolves it into a paste. Sounds gross – ha. But these muffins are SO good! Please clarify… The recipe calls for 2 cups of All Bran, which you mix with water in step 2. Then in step 7, you say to add 1 cup of All Bran. Is that an additional 1 cup (3 cups total)? Yep that is right! If you look at the bottom of the recipe, there is an additional 1 cup of all-bran in the ingredients. The reason you add the other in later is it enhances the texture. These look lovely – I do have a question. Some of your recipes have a PRINT button that lets me print a tidy copy of the recipe. Some dont. Is there some way to print just the recipe and not the entire post? Hi Cheryl! It’s true. We’ve cycled through about 5 different blogging platforms since starting this blog, so some of our posts have different formats. Recipes like this one, I just have to highlight the text and choose to print selection only. Hope that helps! How long do the muffins last in the freezer? thank u very much but is suger is good for 14 months old? If they are in an air-tight container they will last up to 3 months. I love your recipes and tried quite a few. I will try these over the weekend. I also wanted to know how long they would last in the freezer and do you think I can use the raisin bran cereal to make it? If they are in an air-tight container they will last up to 3 months. You could try raisin bran cereal, but I think they will have a slightly different flavor and definitely a different texture. Patty, how did they turn after those extra 7 more minutes?? Soft, crunchy on top?? Yes that would work. We also have a couple of different methods on our blog for making your own applesauce. My 10 month old daughter loves her finger food and I’m thinking of making these for her but would I be able to omit the sugar and applesauce and substitute with mashed bananas? I am a little weary to add a full cup of sugar into the mix, is there possibly a healthier alternative to the sugar that could still give them a delicious taste? Honey maybe? If you replace with honey, just turn the temp down by about 25 degrees, as honey browns faster than regular sugar. You can also cut the sugar in half and see how your family likes it! We have a gluten free category, and also a gluten free meal plan that may be a good option for you. I’m not sure tweaking this recipe to be gluten free would turn out very good. Can you substitute honey for the sugar? Or even brown sugar? You can substitute honey, but it will make your muffin a little darker and give it a different flavor. Yes you can substitute brown sugar without really any difference except a slight flavor change. My son can’t havr dairy. Is there a substitute for the buttermilk? what would the recipe be for a gluten free muffin? The applesauce is to replace the butter in the recipe. You can exchange applesauce for butter 1:1 ratio. Hi, how much salt should we use? The ingredient list only states “1/2.” Is that half a tablespoon, teaspoon or cup? Thanks! Sorry about that – it is fixed on the recipe now! Can you use oat bran instead of allbran? I’ve never tried it, but if you do let us know how it turns out! I like this brand. http://www.amazon.com/Natures-Path-Organic-Psyllium-10-6-Ounce/dp/B001ELL3DM Not sure how it would turn out in this recipe, but it might be worth a try! Great recipe, thank you! I used All Bran Buds as that’s all I had on hand, and they turned out great. Added a bit of banana too. I’m sure this will help keep things moving for my 2 year old! What is the nutritional information on one of these great muffins? These are amazing!! Thanks for sharing this! My whole family loves them! They are so yummy hot out of the oven with melted butter on top. Mmmmm…. No recipe with 1 CUP SUGAR is healthy. Sugar is addictive and bad for the gut. Especially children shouldn’t have ANY in their diet. Can’t you use dates/rasins paste? You just can’t advertise it as “healthy breakfast choice”!!!! We are a very moderate site and believe that small amounts of sugar in children’s diets are ok. We try to be very balanced in our approach with children. Our goal is to get kids to develop healthy habits by focusing on the things they should be eating, rather than focusing on what they should not be eating. This recipe makes A LOT of muffins and so the amount in each muffin is very small. I cut down the sugar by half. I felt like one cup was too much. They turned out great. And I added a handful of raisins too. I absolutely love this recipe!!! I add fruit to the recipe and it really adds a lot to these awesome muffins! I was so happy to see the nutritional value with it as well. Would you be able to tell me what the saturated fat amount is please? Taste like my great grandmothers recipe I’ve made for years. These are just as good. ?? These muffins look delicious! This is not in any way a criticism (I’m just curious), but you highlight the high amount of fiber in these muffins, but when I looked at the nutritional facts, it states that it has only 1g of fiber per serving. This doesn’t sound like much. Am I missing something? Delicious! Added some chocolate chips, because… kds! Surprisingly good! I added a few chocolate chips to add a little bit of sweetness. Husband and kids loved them! Okay this recipe was AMAZING. My toddler actually ate an entire muffin herself! More than once! Plus I normally hate bran muffins but I loved these. Great recipe. I substituted 3/4 cup of maple syrup for the 1 cup sugar and I added raisins. Don’t be put off by the amount of sugar. This recipe makes a whopping 4 pans of mini muffins. Considering most recipes half this size call for the same amount of sugar, it’s very reasonable. I do not like an overly sweet muffin and I found these to be perfect. They were a big hit with my toddler too! Thanks for the great recipe! The ingredients call for 5/2 tsp baking soda and 3/2 cup whole wheat flour. What are the correct amounts for these 2 ingredients? I am going to make these for my grandson and I need to make sure I have the correct measurements. Hi Lisa, sorry for the confusion! We made some big updates to our site over the weekend and it caused some technical issues with our recipes. Everything should be patched up now and the recipe amounts should look normal. Thanks for your patience! Yummy. For me made 24 muffins as I like to fill the muffin tins almost to the top. Since my grandson is constipated often, I replaced that cup of water with warm prune juice. I think it worked out well!